The manual says the “battery type” is 55D23L, with a 48 A·h capacity. Definition of Group Size: The Battery Council International (BCI) assigns numbers and letters to common battery types. These numbers and letters are standards for maximum container size, location and type of terminal and special container features. So, it’s random. Choose a retailer, feed in the automobile year / make / model, and discover I need a Group 35 battery. So, if you’re building an automotive gadget and expect the battery to deliver something like 12 V, you’re wrong. Bonus protip: look up “load dump” to get an idea of the highest voltage. So a constant load of 2.4 A would do the trick, should you leave a few lights on overnight during the summer. In wintertime, you’re on your own. Because hell hath no fury like that of an unjustified assumption, the terminals are on the top surface toward the rear, with the positive lug on the left when you’re standing at the front bumper. That may be the “L” in “D23L”. 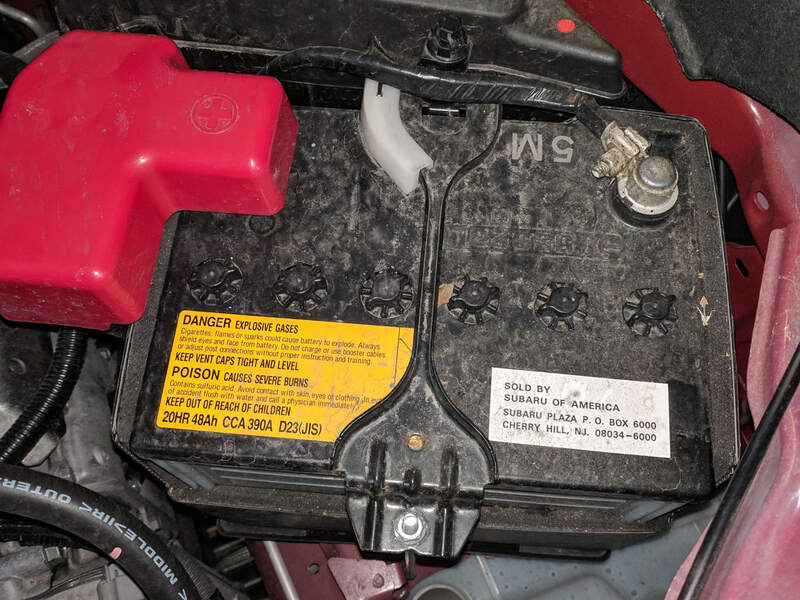 Long ago, I ran afoul of an automotive battery which required knowing the terminal chirality and, of course, I bought the wrong one. Now I have a picture! This entry was posted on 2019-02-17, 07:18 and is filed under Electronics Workbench, Home Ec. You can follow any responses to this entry through RSS 2.0. You can leave a response, or trackback from your own site. I drive a 2014 CRZ and it has what the auto stores called a baby battery, it works fine until extreme cold hits. A few weeks ago it required a charger overnight in order to have enough CCA to do the job. I have considered seeing what the next size up is and retrofitting a larger battery. However, if they could have gotten a larger battery they might have put it in there to begin with. Funny how in a hybrid I’m sitting on a bank of batteries and yet sometimes there is no way to start my car.